On 1 February 2010, Dr. Terrence A. Renner became the new executive director of the International Union of Pure and Applied Chemistry. Renner succeeds Dr. John W. Jost who headed the Secretariat for almost 13 years since its move to Research Triangle Park (RTP), North Carolina, from Oxford, UK, in 1997. Renner comes to the IUPAC post from NanoInk, Inc., where he was director of applied science. He obtained his B.S. degree in chemistry at DePaul University in Chicago, Illinois. Thereafter, as a National Science Foundation Graduate Fellow, he completed his Ph.D. in physical chemistry at Yale University in New Haven, Connecticut, as a student of Philip A. Lyons. Renner’s working career has encompassed the fields of nuclear, environmental, physical, organic, surface, materials, process, and petroleum chemistry. More recently, in the realm of nanotechnology, his experience expanded to include the interface of chemistry with biology, biochemistry, and pharmaceutical chemistry at the nanoscale. Renner is an accomplished executive who understands the importance and relevance of both pure and applied science within the practical context of business and product development. He has represented companies globally in discussions and negotiations with academics, business leaders, and government officials at all levels to attain mutually beneficial objectives. 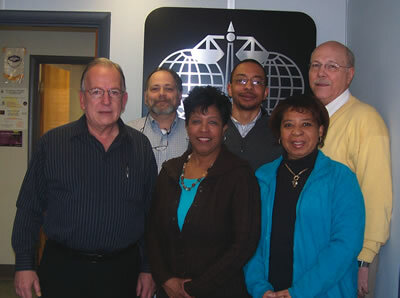 The IUPAC staff at the Secretariat (from left to right): (front) Terry Renner, Linda Tapp, and Enid Weatherwax, and (back) Paul LeClair, Bryan Pearson, and John Jost. IUPAC Past President Jung-Il Jin pointed out that Renner’s appointment comes as the Union prepares for the International Year of Chemistry in 2011. Jin expects that Renner will play a major role as IUPAC leads the world chemical community into the International Year of Chemistry. To ensure continuity, Jost will remain as a consultant to Renner until he formally retires on 31 August 2010. Jost will continue to be the managing editor of IUPAC‘s journal, Pure and Applied Chemistry.